We are currently looking for a small team of volunteers (maximum 6 persons) to join us in Trang, southwest Thailand to undertake a structured survey of the Indo-Pacific humpback (pink) dolphins in Chai Mai Marine Park. The tentative team dates will run for 2 weeks from Sun 15th to Sat 28th April 2012. Costs are still to be confirmed and should be no more than 650 GBP per person (approx 1,000 USD), to include ALL accommodation, food (set buffet style menus and shared accommodation in air conditioned rooms based in a coastal resort on the island of Koh Libong), full equipment costs, boat trips, tours etc. We will be working from a traditional long-tailed fishing boat with a Chao Lai (local sea gypsy) Captain in a mangrove coastal ecosystem, which is also home to a threatened dugong (sea cow) population currently being studied by researchers from the Phuket Marine Biological Centre (PMBC). 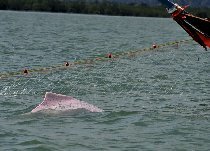 Our goal: to record and photo-identify the individual pink dolphins inhabiting these shallow coastal waters, and have an all-round super time together in a relaxed, informal setting with all the usual CRRU trimmings – outings, trips and educational fun! This promises to be a really unique opportunity to see rare dolphins and dugongs in a sea grass habitat; eat great, healthy food; and spend time in a beautiful Thai province that is still largely unaffected by mass tourism and development. However, places on this "one-off" team are limited, so anybody interested should get in touch and register their interest ASAP so that we can answer all your questions!